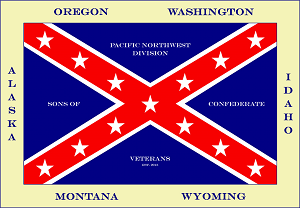 Welcome to the Sons of Confederate Veterans Pacific NW Division! Our Division was established in July 2013, at the SCV National Reunion in Vicksburg, Mississippi. The Pacific NW Division consists of six States; Oregon, Washington, Idaho, Montana, Wyoming and Alaska. The Sons of Confederate Veterans was established in 1896, and today has over 30,000 members! Our purpose is to Honor and Defend the Confederate Soldier, promote the Southern Cause of Liberty and make sure that the true History of the South is preserved and presented to future generations! Our ancestors fought against a Tyrannical government, that invaded our lands, killed hundreds of thousands of Southern Soldiers and Civilians. The Confederate Cause was and still is a just cause, the true cause of American Liberty! Membership in the SCV is open to all male descendants of Confederate Soldiers who served honorably in the Confederate Military. If you do not have an ancestor who fought for the South, but you would like to get involved, we would invite you to join the Friend of the SCV. The Friends of the SCV is open to everyone, male or female. Visit http://www.scv.org for membership applications for both the SCV and the Friends of the SCV. 2014 has been a great year for our Division! We have already established a new Camp in Boise, Idaho and are starting new Camps in both Eugene and Central Oregon. The Pacific NW Division is here to assist the local Camps in our area and help them grow. On September 20th, 2014, we are having our very first SCV Pacific NW Division Convention and Ball! It is being held at the Heathman Lodge in beautiful Vancouver, Washington! Soon to be Commander-in-Chief Kelly Barrow and soon to be SCV Army of Trans Mississippi Commander Charles Lauret, are traveling thousands of miles to speak at our Convention. Tickets are only $50 each, which includes a 4 course Dinner of your choice! Visit the Convention and Ball section for more info. Hi Martha, thank you for contacting us about your uncle. Do you know what unit he served in? Please contact me directly by email at imbel308win@yahoo.com. I look forward to hearing from you.